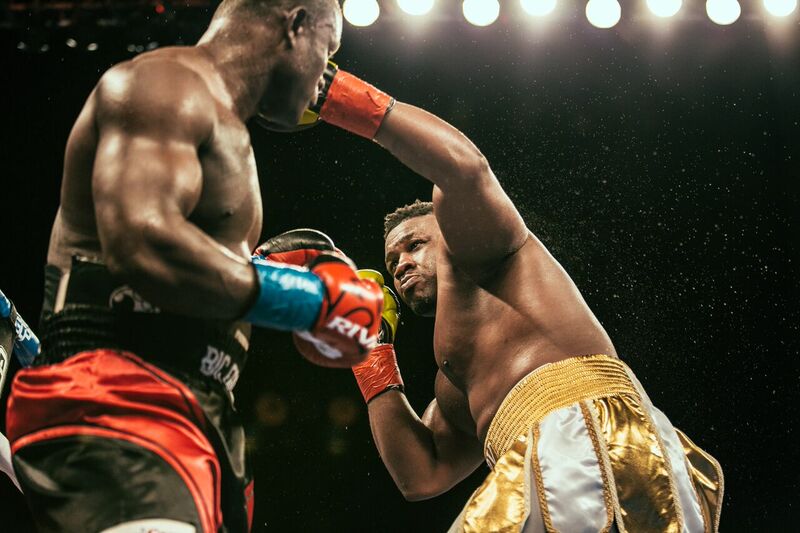 Undefeated heavyweight prospect Jarrell “Big Baby” Miller won by third-round TKO over veteran Fred Kassi in the ShoBox: The New Generation main event Friday from Rhinos Stadium in Rochester, N.Y. Following a cagey first round that favored Kassi (18-5-1, 10 KOs), Brooklynite Miller (18-0-1, 16 KOs), turned up the body work and pressure in rounds two and three. After landing 36-of-57 power shots in the third and racking up 30 connects to the body, Kassi retired on the stool between rounds, citing a hand injury. 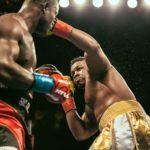 Miller landed an impressive 57 percent of his power shots for the fight and limited Kassi to 22 percent of his hooks, crosses and uppercuts. Kassi said after the fight that his right hand was injured in the second and pushed through the pain for one more round before giving in. The 6-foot-4, Miller viciously attacked the body and delivered some big rights and combinations. Kassi had some moments where he out-boxed his opponent, but Miller’s power and size—a possible 50+-pound advantage—was the deciding factor. With this victory, “Big Baby” ups his winning streak to 14 straight. “I knew it would take some time to get going tonight. I was thinking maybe three or four rounds to warm up and get going. 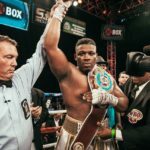 But in the second round, I got my wind and I knew I hurt him,” said Miller, who is ranked among the top 10 heavyweights in three of the four sanctioning bodies. “My legs came alive and I touched his body and his head. I knew I was going to get the stoppage. “I think he could have continued, though. He just didn’t want to. That’s why I take my hat off to Deontay Wilder. I still want to break his jaw, but he finished his fight with a broken hand. That’s what champions do. Kassi didn’t want to continue. 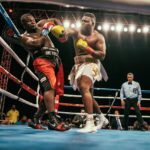 “The size difference and the strength difference was so enormous,” said SHOWTIME Boxing’s veteran analyst Steve Farhood. “Once Miller started rolling, it was clear that Kassi had no answers. Kassi had been nimble and he slid off the ropes a few times in round one. That was gone in round 2. 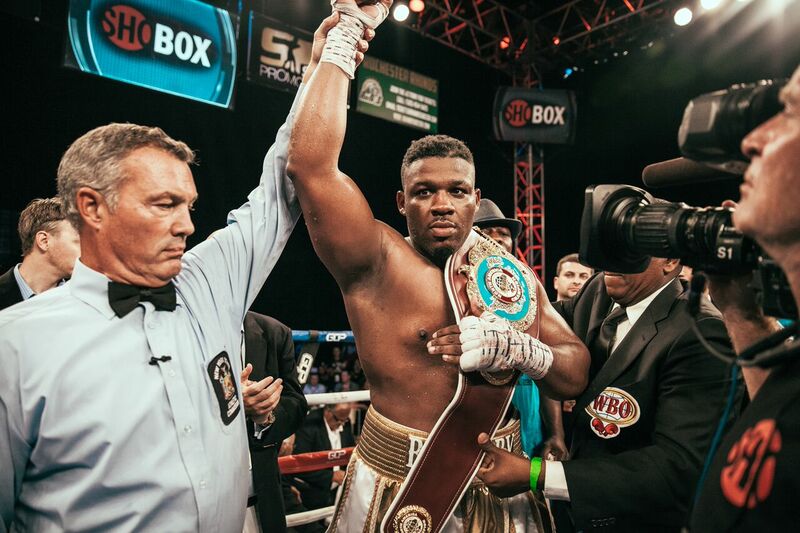 So, perhaps in some people’s eyes, this win is cheapened by the injury, but to me it was clear that Big Baby was on his way to doing what more advanced heavyweights like Dominic Breazeale and Chris Arreola couldn’t do, and that’s stop Fred Kassi. 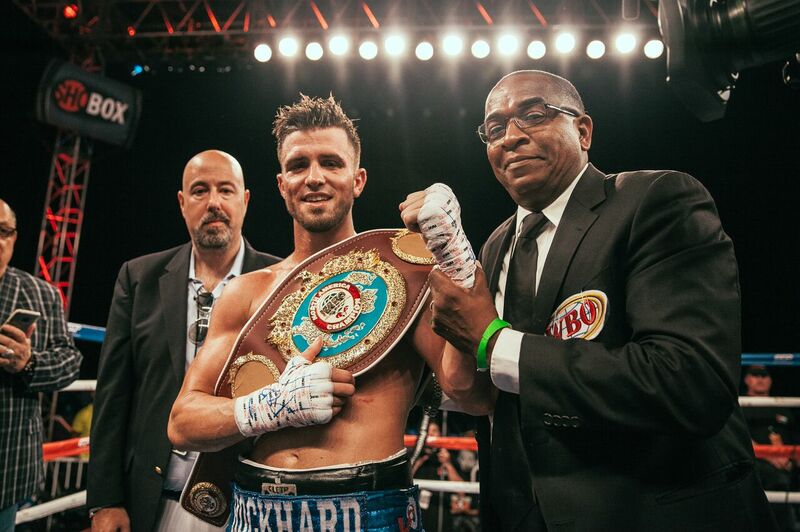 In the co-main event, promising Louisiana lightweight “Rock Hard Mighty” Mason Menard scored a brutal knockout at 2:26 of the ninth-round over battled-tested Bahodir Mamadjonov, winning the WBO NABO Lightweight belt. Both Menard and Mamadjonov were facing their most dangerous foe to date. 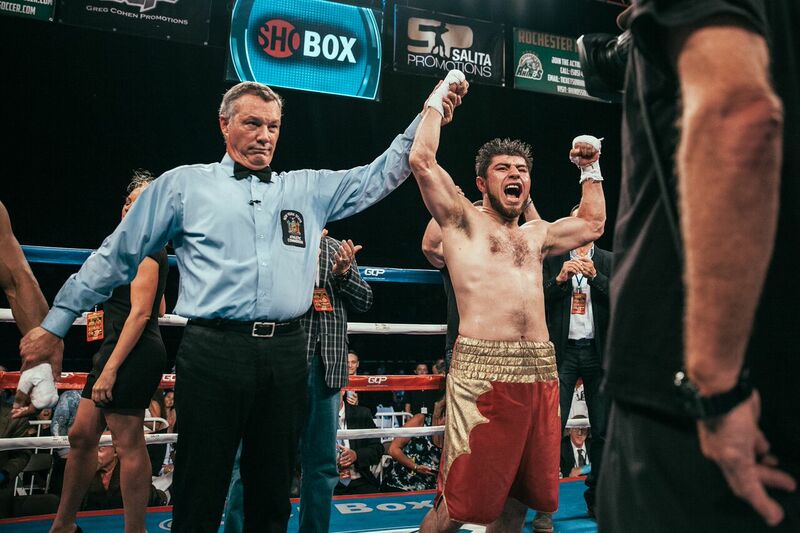 Mamadjonov (18-3, 11 KOs), showed great ring generalship successfully keeping Menard’s output down for the first six rounds, but Menard (32-1, 24 KOs) dramatically turned the fight around with body shots that produced two knockdowns in the seventh. 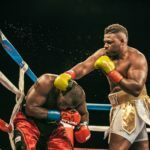 A slow eighth-round followed but the ninth brought another series of power shots leading to the third and final knockdown, prompting referee Steve Smoger to intervene and halt the contest. 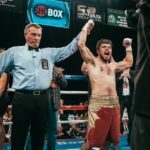 At the time of the stoppage Menard, who out-landed Mamadjonov 10-0 in the bout’s final 26 seconds, was ahead by two points on two scorecards and four points on the third. “I feel great, but it was a B-level performance from me,” said Menard who is coming from a knockout-of-the-year candidate, “I could have done better. My opponent was an awkward fighter and we got him with two weeks’ notice. “I knew if I kept putting the pressure, slowly he would fade and I would take him out in the later rounds and that’s exactly how it happened. He was hurting to the body. I knew after the first couple rounds he was breathing really heavy, so the game plan was to start touching him to the body. It was affecting him greatly. 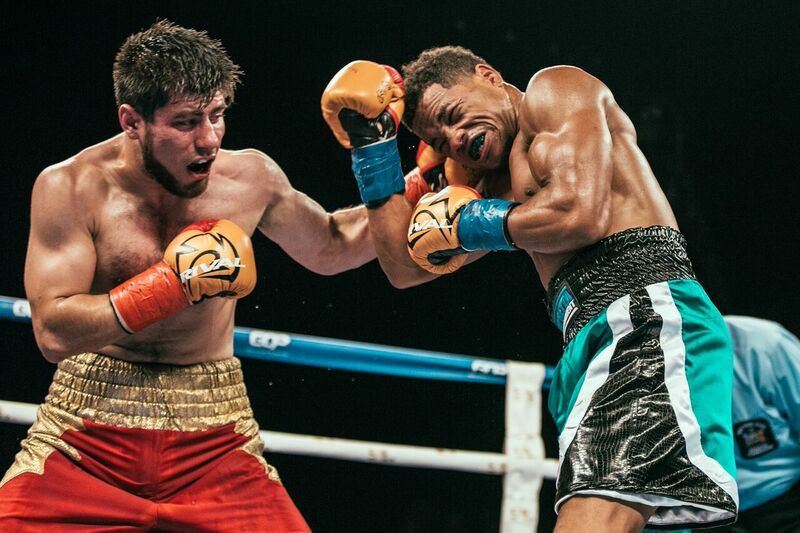 “I don’t really know what went wrong,” said Mamadjonov, who is known for his high boxing IQ. “It was short notice and I think I lost too much weight. 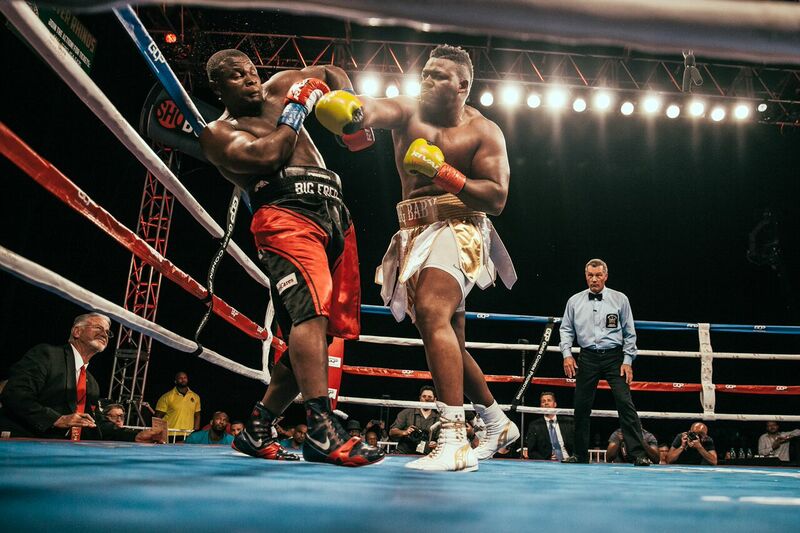 “I didn’t feel his punches, but he caught me with some good body shots. I was fighting evenly with him until the weight loss caught up to me and I got tired. 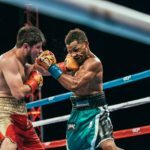 NABO Bantamweight Champion Antonio Nieves, of Cleveland, Ohio and Tijuana’s Alejandro Santiago battled to a 10-round split draw (96-94 Nieves, 96-94 Santiago and 95-95) in the second fight of the ShoBox quadrupleheader. 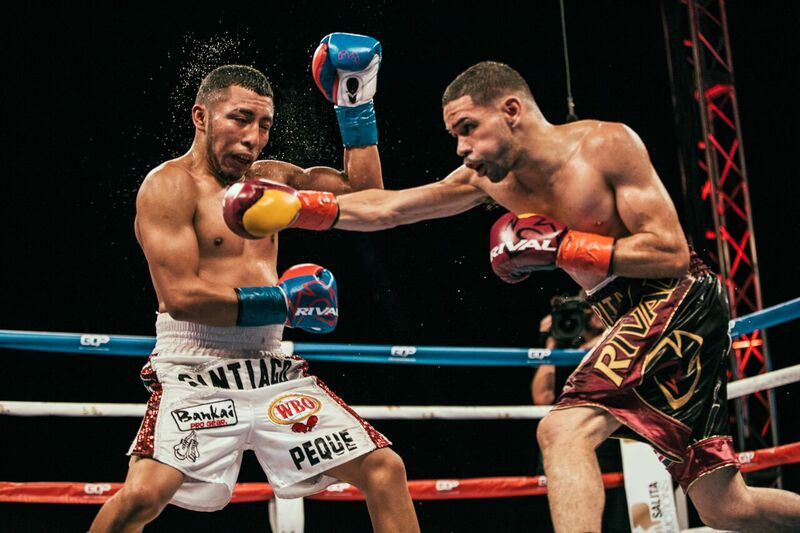 Nieves, (16-0-2, 8 KOs), remains undefeated, but Santiago’s (11-2-2, 3 KOs) boxing ability clearly caught him off guard. The first five rounds featured brisk long-range boxing that was incredibly even. 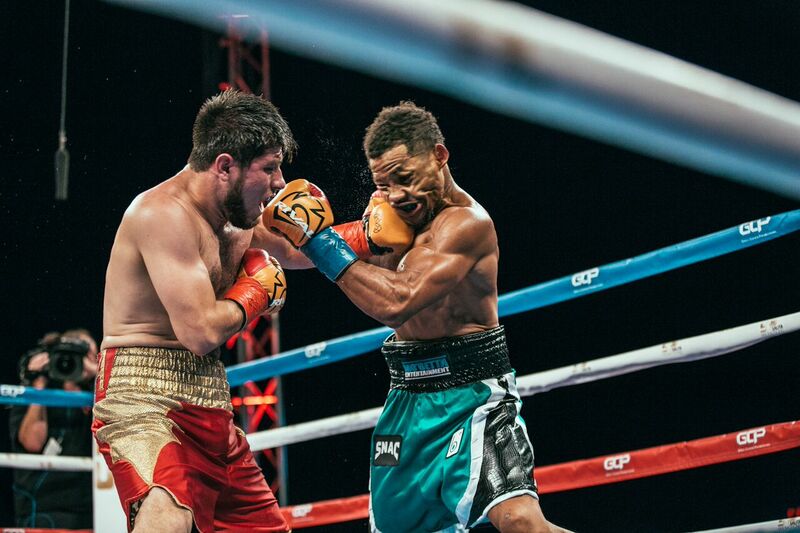 Santiago, a late-sub for Nikolay Potapov, appeared to pull away in rounds 6-10 as he out-landed Nieves 129-86 overall and 100-61 in power punches. Winning the late rounds was not enough for Santiago, who was stepping up in weight and opposition. Judge Don Ackerman had Nieves ahead 96-94 while Eric Marlinski had it 96-94 for Santiago. Pasquale Procopio’s 95-95 card proved pivotal. Given Santiago’s second-half surge, the Mexican visitor was unlucky not to get the win. “I thought it was close, but I think I pulled it out,” said Nieves. “I should have gotten the victory by maybe one or two points. But the judges see what they saw, you know? “I do not feel I put on the impressive performance I was hoping to. I wasn’t at my best. He (Santiago) was a little awkward and my right hand was hurting a little bit, but I really don’t know why I wasn’t letting my hands go like I usually do. 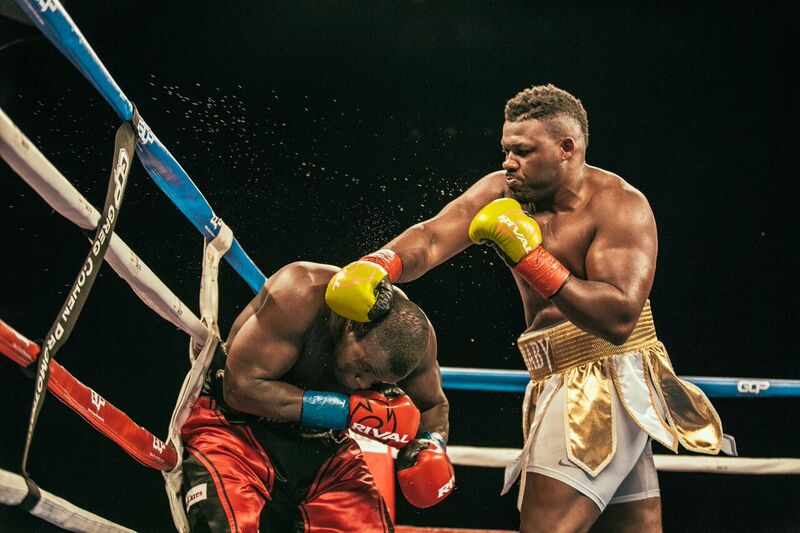 “I learned I have to stick to my game plan and keep using my jab. I didn’t use it like I usually do. I need to just do what I do and not worry about what my opponent is doing. Santiago, who came as a late replacement and was clearly the underdog, also felt he won the fight. “It was close, but I think I won the fight. I was always sure I’d beat him and I did. 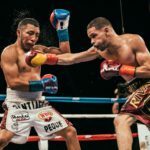 I landed more punches,” said Santiago. “I thought Nieves would be stronger than he was in there. 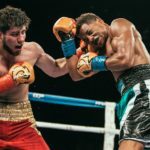 In the opening bout of the telecast, undefeated welterweight Bakhtiyar Eyubov of Brooklyn, N.Y., by way of Kazakhstan won a close 10-round split decision—that could have gone either way—against veteran Karim Mayfield of San Francisco, Calif. (95-94 twice for Eyubov and 95-94 for Mayfield). Eyubov (11-0, 10 KOs), who had never been past the third round, was taken to uncharted waters by the more experienced Mayfield (19-4-1, 11 KOs). 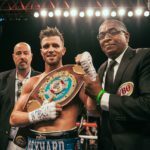 Mayfield extended Eyubov far longer than any other opponent and despite out-landing the adoptive Brooklynite in each of the final four rounds (110-80 overall and 87-66 power) Eyubov escaped with a split decision. It was a learning victory for Eyubov and a disheartening loss for Mayfield, who averaged 69 punches per round to Eyubov’s 52. “I felt it was close, but I did everything I wanted to do and I feel I won nearly every round,” said Eyubov. “I was surprised by Mayfield, especially how hard his head is. He is a real man. “My lip is a little swollen but that’s because of headbutts. Mayfield fought dirty in there. But I’m happy with the decision. I learned that I can go 10 rounds if I have to. I could go 12. I was still strong at the end of the fight. Mayfield, who was clearly disappointed with the result, felt he won the fight. “It was a good fight and he’s a tough fighter for sure, but I landed the harder shots and kept active. He was a tough guy, don’t get me wrong, but I certainly won that fight,” said Mayfield. “I feel I performed well. There’s always more work you can do, but for the most part I feel I did good. People thought for some odd reason the fight wouldn’t even go the distance, which is ludicrous. I won the fight though. “It was part of my game plan to frustrate him and I feel I did that. I executed my plan well. Of course, there was more I could have done. I could have thrown more punches, but I did well. “They made it seem like he punched like hell, but I guess all punches feel hard to me, so if you’re a hard puncher or a light puncher, it’s still a punch and I don’t want to get punched. I got hit but I was never stunned or anything like that.